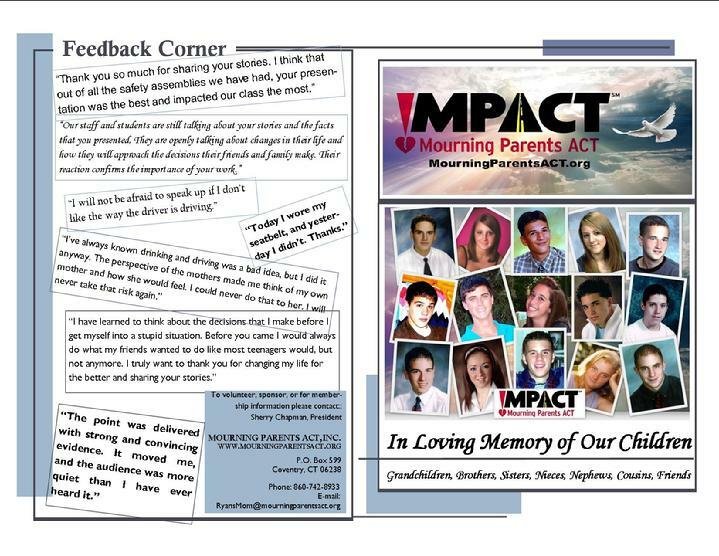 Mourning Parents ACT, Inc., also known as !MPACT, is a nonprofit organization whose mission is to eliminate tragedies caused by inexperienced drivers through awareness, education and legislation. Who are the members of !MPACT? Members of !MPACT have either lost teenage family members or friends in motor vehicle crashes, or are survivors of crashes involving teen drivers. Members volunteer their personal time and resources to advance the mission of the organization. 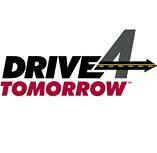 !MPACT has developed a teen driving safety program in which members share their personal experiences in a powerful presentation that has proven success in promoting safe driving and riding behavior in teens. Teens learn about the shocking statistics, risk factors, what happens to the body in a crash, what the states are doing to protect them and what they can do to protect themselves and their friends. Feedback from attendees indicates that this program effectively reduces risky driving/riding behavior in teens. !MPACT has also developed a program for parents, educators and law enforcement officials; and has worked closely with state and federal agencies and legislators to advance legislation that protects teen drivers, their passengers and the people who share the roads with them. Would you like !MPACT to present at your school or organization? If you would like !MPACT to visit your school or organization, please contact us. There is no fee to high schools, however monetary donations to advance the mission of !MPACT are welcome.